Are you a native New Yorker? If not, when and why did you move here? No, I am Italian. I graduated in Venice and I moved to New York in 1998. I have been living in the city since then. I came to this incredible city for a reason that was not in our infographic, love. I followed my future husband (a New York architect, graduate of Pratt Institute in Brooklyn). Together we founded our design firm, Matiz Architecture & Design, in 2002. We are now 10 people and proudly serve clients in the private, academic, food, and health sectors of this incredible city with a variety of design services. New York gave us the opportunity to bring our passion to reality. I am an architect by training (I graduated from the IUAV – Architectural Institute in Venice – Italy). My experience and passion for the 3-D space has led me to a more graphic and visual interpretation of architecture and design. How did you hear about NYCEDC and this competition? Through the NYCEDC blog post this summer. As a small business owner, I am always trying to follow educational and business opportunities in social media. This one seemed very clear on the content, challenging, and fun. 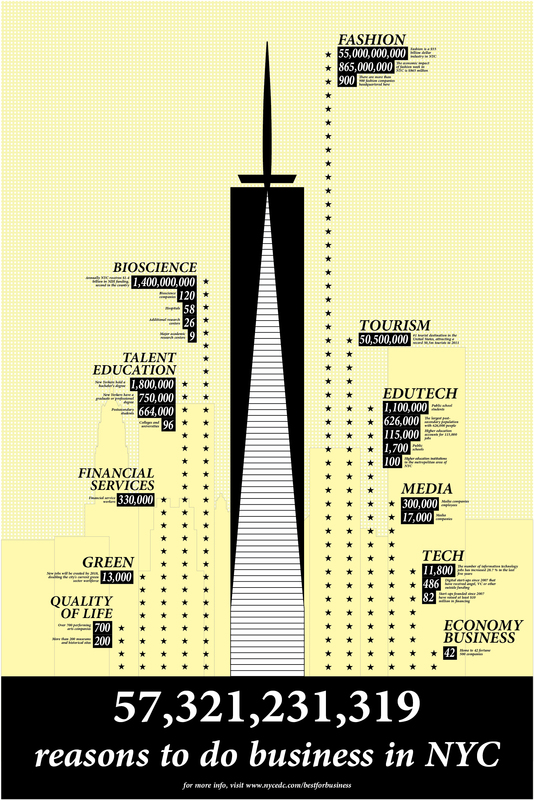 What was your design inspiration for the winning infographic? How did you come up with the concept? Business and big numbers inevitably go hand in hand. I immediately thought about the most important "message" to communicate—what’s the story behind the data and numbers. That’s how I focused on the overall big number, the 57 billion reasons to do business in NYC. This is a number that in fact is a sum, the sum of the actual data, but also the sum of all the hard work, the many talented people, and the energy of this city each year, no matter all the difficulties. NYC is always looked to as a symbol, a global reference for business in the world. That’s the main message. I then zoomed into the "how" to communicate the details, still in a narrative way, using [1 World Trade Center] as a way to identify that NYC never stops. No matter all the difficulties and challenges, it will always be ready to add one more reason to do business. Who is your favorite designer in the City, or what is your favorite example of information design in the City? This is a question that has multiple answers. I interpret the word design in many different ways. Design to me is a way to think about space, to explain ideas, model behaviors, make objects, create brands, and create business. So I think that in this moment what I most consider valuable and "my favorite" is the "thinker," the labs where new ideas are created, where the modeling of our future society is molded. Social media has allowed me to have instant and constant reference boards (TED, The Spatial Information Design Lab at Columbia, IDEO, Behance, to mention a few). There are many great designers in different fields that contribute to shaping this amazing new era we live in. As information designers I would like to mention a few constant go-tos for us, like Nicholas Felton and Edward Tufte. For you, why is New York City the best city in the world for business? Without a doubt… opportunities and possibilities.